The sound of chain saws reverberates in the old hometown. We had a brief but violent storm yesterday, and it took out a lot of trees. Nearly every yard has a branch down, and cleanup tops everyone's list today. Once that is done we will return to the business of preparing for the 150th Anniversary observation of the Battle of Lexington 9/12-9/18. Do check out www.visit historiclexington.com If you plan to be here, make arrangements ahead. We are expecting, "they" say, between 20,000 and 30,000 people. Certainly would be good for the local economy, and let's all pray for good weather. Unique events include a Film Festival (all Civil War themes) and an Author's Forum. We also will be having the Lexington Community Fair (Aug. 15-20) and the Apples, Arts & Antiques Fair in Oct. You can find more on those events at the same website. For nostalgia, visit www.thelexingtonconnection.com !!! The heat wave that has tortured the nation didn't ignore us. We had a long string of days in the 100s, one day even set a 40-yr new record, but today is lovely. We have the house open, doors and all the windows that aren't painted shut. As always, I have sad news to report. We lost a Lexington icon, Dave Frerking of Dave's Cafe, formerly The Dragon Den. If you would like to drop Flo (Florine) a note, the address is 1815 South St. 64067. The other loss is from an icon family too - Benny Entine died this week, much too young, as did his brother Allen. There is quite a little mail to share. Speaking of the "Goosepond," I would like to add: Douglas High School played all its home football games there. Indeed. And John '57 Graves remembers other events. After reading about the Goosepond I had some flash memories. When we were young I remember seeing donkey softball, church league softball and midget car races at least once and of course those really hot days of football practice. I really look forward to the TLC to keep up on things now and in the past. I feel for the people in Joplin for as you know we had our share of tornado damage here, some quite close to our home, but none to our home. Keep on keeping on. I loved the story about the Goosepond! My family and I were discussing how Lexington looked "back in the day" and the topic of Snappy Service came up. Remember that little diner next to the movie theatre? Can anyone elaborate on its beginnings? Also, my favorite memories of Lexington in the 60's are when we had such wonderful shops such as Stier's, Harry Smith's, Beissenherz Jewelers, Estrin Jewelers, Mode O'Day and Connor-Waggoner's. And I also think of Maib's Cafe. Of course, The Modern Cafe was my favorite since Kay and Jimmy Lorantos are my aunt and uncle. They made the best "wet tenderloin" sandwich I've ever had! Sometimes we'd just like to hear more...right everybody? I'm so sorry to learn of the passing of Norman Vialle. When I was born, my mother delivered me at Menorah Hospital in Kansas City. It was 1944 and my father was overseas during the War. Norman was 16 years old at the time and it was Norman who came to the hospital and picked my mother and myself up in his car. Norman later told me that the nurses congratulated him on having such a cute little baby, and he had to explain that it wasn't his. As usual, your timing is perfect. I was worried about the storms hitting home, but not the tornadoes. I always believed what I was told as a child that a tornado would never hit Lexington because of the river bluff - that it would follow the river where it flattened out. Never knew whether it was true or not, but it always made me feel safe growing up and I also thought, kept the town safe. Our family is spread pretty much throughout Missouri and we have family in Joplin too. Thankfully they were okay , but we all grieve for the horribleness that happened to the town. I have to agree with Wayne (Tabb) about the 'times of our lives,' if for no more than the glorious innocence and freedom from fear while growing up in Lexington. Lexington is special to all of us who ever lived there, because of those memories. It takes the perspective of decades to realize how blessed we were. Susan, having worked for Dave Frerking at the Dragon Den for several years in the 50s, I wrote a little piece of "Goodbye to a Friend" after he died in July which got printed as a Letter to the Editor in the Lexington paper. It got me to thinking about the only other two eateries, hangouts for teens, that I could think of in Lexington, being the Maid-Rite and Snappy Service, next to the theatre. I know Norman Vialle died this summer but didn't know him well but thought surely there would have been some tribute of him written to the paper by now probably by somebody on the TLC list since he and his establishment were such an institution in our home town. Ot it could appear on the TLC web site. On rare occasions when I did have money and went in there after a football game or something I remember Mr. Vialle (didn't we always call him that??) standing at that hot stove top chopping up the ground beef and onion and always thought he was a very sweet, kind fella. Bet he just loved all those teenyboppers!!! My memory of Snappy was when I worked there briefly with long-time employee Mrs. Alda Holman, Mary Ann's mother, and Gary and Gene Jarman. They always kidded me unmercifully. I was so shy I was embarrassed to yell out the order like I was supposed to do, so just went up to them after I got the order and softly passed it on to them. They said I would never make a good waitress that way. Another vivid memory I've written about before was in 1955 when Irma Boldridge and I went in there for a Coke and got served sitting in a booth for the first time instead of her standing outside at the window. Shameful times, those. Somebody's got to have good memories of that place too, probably Mary Ann. I also worked at Joe's Cafe up the street for Joe Bookasta, wonderful family, EARLY in the morning during summer. Called it a "Greasy Spoon" not because it was, but the clientele were kind of rough, dirty workers. I learned that you could cook just about anything for breakfast as long as you had enough bacon grease. And that led me to my third point since we are S-L-O-W-L-Y navigating from this unbeatable heat into fall (Dave and I sat outside this afternoon, Sunday, when that 60 mph wind was gusting and the temp. lowered to 74 from 94 in less than 15 min. and we said "THERE IS A GOD!" never thought we'd feel air like that again!) That reminds me of Fall Festival, the parade, Liz White drum major, the carnival, full cotton skirts, cinch belts, band practices in the hot band room and getting measured for new uniforms (I can still smell that hot wool), wearing blue jeans, white shirts and red neck scarves in the parade since our uniforms hadn't come in or would probably have been way too hot. More memories, anyone??? I have wonderful photos of "back in the day" downtown and am using them for our Downtown Buildings History Project. One day I'll publish some on the website, with the talents of Webmaster Ball. If you have ANY photos of Lexington from its inception up to 1999 or so, please send them to me. Scanning would be fine. It's a fun project. However, as soon as I finish one building and begin to research the next, I invariably run across more information on the first! It is a slowwww work in progress. Mary K. Wilcoxon '58 Gooseman has been a fantastic source of photos from the (waaay) past to this century. In brief, the first (brick) building (in the inset) was lost to fire fairly soon after it was built in the 1850s (when a priest from Independence began regular trips to Lexington on horseback). Someone recalls being told that the fire happened just after an organ was installed. That Church was quickly replaced by the small structure (inset) when Lexington received its first resident priest. Neither did that second building have a long presence on Highland; historians tell us it was "blown down" in a "wind storm" in 1870-something. This led the Catholic congregation to purchase the quarter-block at 18th and Main where the present Church was built in the 1880s and later the rectory, convent, and first school. It's not clear what "embellishments" the photo's caption refers to (early 20th century). If anyone wants details (dates, locations, the Catholic congregation), Jim can supply them. As for those old Stations of the Cross, I saw them and didn't recognize them, so for me it remains a "mystery." Susan, I enjoyed TLC #132 very much. The story by B.M. Little, Jr. about the Goose Pond and the building of the old swimming pool gave me a big smile. The swimming pool was to the northwest of the old High School building. In the '50s or so a building was built over the remains of the pool. Actually I believe it was the tennis courts. The Ag building was on the northwest portion of that section in the back. It was an annex to the high school and probably an ag building or something like that. 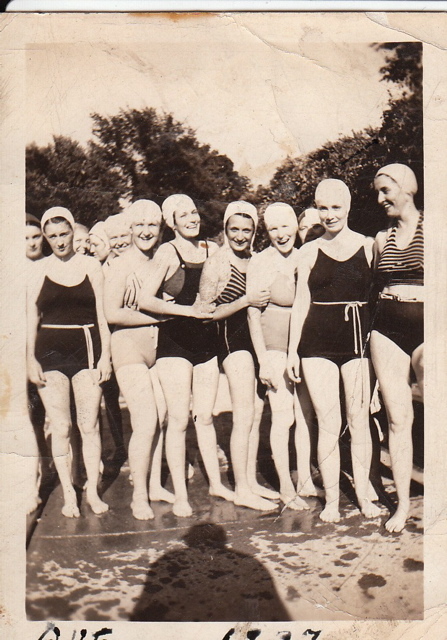 I've included a picture taken at that pool around 1937 when there was a Beauty Contest held there. My mother, Hazel Terrell O'Malley, was the second place winner of the contest. She was 26 years old. She's the second from the right in the picture. I was there, but I was just a little fellow of 6 or so and don't remember the picture being taken. Unfortunately, I don't know the names of the other ladies. Perhaps some of the viewers can identify them for us. Isn't Lexington history fun!!! Best wishes to all. I hope the photo reproduces. Does anyone have any other IDs for this??? I am hopefully responding to Susan Shea Worthington, When I saw your email and the names included, I quickly surmised the information was regarding the First Christian Church in Lexington. I recognized Nekie Braswell's name as she and her family lived across the street from us there on South St. Of course I knew George B. well and have seen him a couple of times over the years. You know the church there holds many cherished memories for me - one special one, my baptism. Dr. Sill was there the majority of the time that my parents and I were members. Of course I am wondering why there is a "last formal service." I had heard at one point that the attendance was very low, so I am wondering if it has lessened to the point that a budget could not be supported. I would love to be in attendance at the service on Sunday and if it weren't for the fact that we have been out of town and missed our own services for 2 weeks, I would definitely be there. I'll need to do some serious thinking about this. Thanks for the interest in the Church. We have decided to merge with the First Presbyterian Church on Franklin and 10th Street. It wasn't an easy or quick decision, but expenses were too high for our existent congregation. The merger is going well and we have put our Church up for sale It also includes the lot beside the Church and the lot behind.